In accordance with the new study carried out by the Spanish researchers your chances at developing heart problems, atherosclerosis in particular, greatly increase without breakfast. 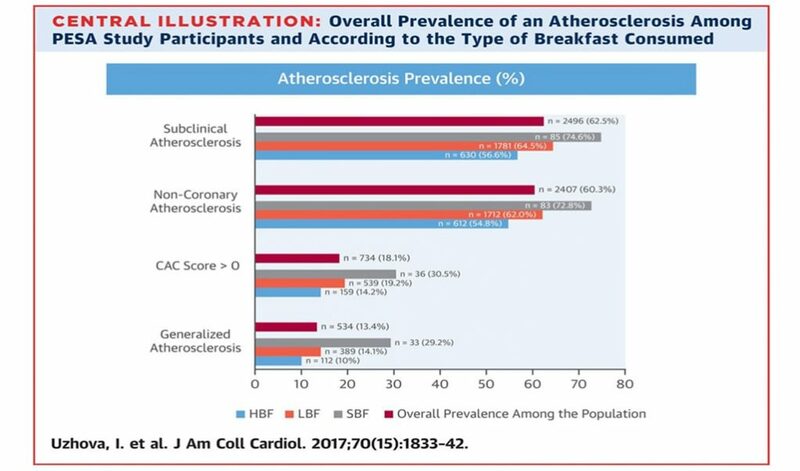 The study was recently published in the Journal of the American College of Cardiology and aimed to understand how different breakfast patterns affect our chances of developing (or aggravating) a cardiovascular disease, namely, atherosclerosis. The study is not a finished project, far from it – its 4,052 participants (males and females) are adults aged 40 to 54 years; and they are planned to be followed for about 10 years at the very least for the results to be conclusive. Those are mostly Spanish bank employees who take part in the PESA (Progression of Early Subclinical Atherosclerosis) study. All participants haven’t had any trace of a cardiovascular disease in their medical history before. 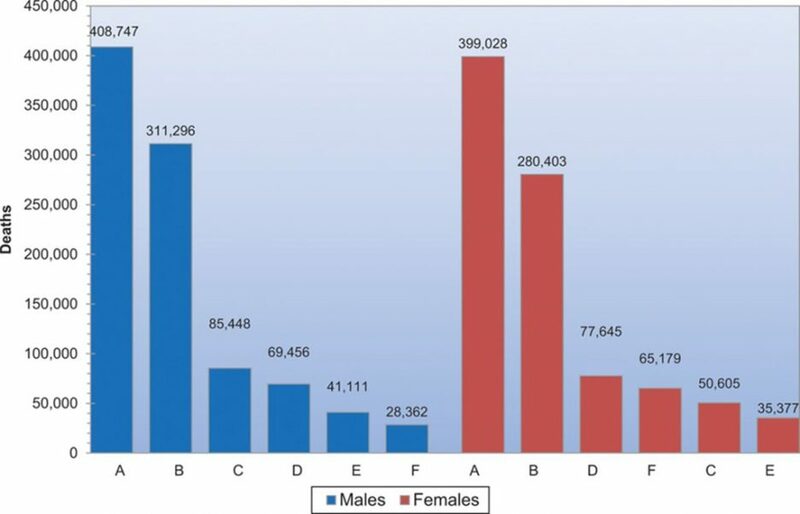 In the course of the study the volunteers were medically assessed as well as underwent a computerized questionnaire that covered the particulars of their general diet, breakfast patterns and lifestyle choices in the past 15 days. and only 3% of the participating volunteers reported skipping breakfast (<5% daily energy intake). Then they were assessed with the help of the imaging techniques that allowed to trace the extent of the atherosclerosis the arteries and its risk of further development. Apparently, the study suggests that personal traits and daily habits are another non-classic risk factor that can lead to atherosclerosis; with breakfast-skipping being one of the most common and unhealthy habits in this respect. Why Question Breakfast in the First Place? A – cardiovascular disease; B – cancer; C – accidents; D – chronic lower respiratory disease; E – diabetes mellitus; F – Alzheimer disease. Source: National Center for Health Statistics and National Heart, Lung, and Blood Institute. there is no surprise that the link between the two has been attempted to be traced. Whether this importance is a true and justified concept, it is still hard to say as breakfast has long been a subject of heated debates for years. There are quite a lot of cultural and social patterns involved, and also a great deal of marketing. However, we have been fascinated with breakfast not really for that long as we tend to think, and, clearly, we used to have our first meal in a variety of different ways before some of us decided that cereal can save us all. For those who are interested in the history of breakfast, there is a good book by Abigail Carroll – Three Squares: The Invention of the American Meal – there is lot about breakfast pattern changes through time. One thing you will learn, for sure – it was a meal nonetheless, and it wasn’t something that people tended to skip. The controversy came later. There have been a variety of studies that tried to decipher the benefits and shortcomings of breakfast as a meal, its necessity and its content’s impact on a person’s health. Some studies say that breakfast is good, and a good breakfast is even better. An interesting example is the “Alameda 7” study from 1965. The study traced the habits of the Alameda County (California) residents that included lifestyle patterns in general and breakfast habits in particular. The long-term observation got a number of interesting results in regard to longevity and health. In was repeated in 1985, and it also showed an interesting correlation between the groups and breakfast-skipping, among other things. However, there have been other studies that are not so hasty to claim breakfast as being either solely beneficial or otherwise. Canadian researches studied 12,000 adults and their breakfast patterns in correlation with body mass index and tendency to obesity – and found none. Also, a more recent study from the American Journal of Clinical Nutrition revealed that it doesn’t make any real difference whether you eat breakfast or not – if you want to lose weight. But regardless of their number and frequently contradictory nature, most of the studies echo each other in one thing – our poor dietary choices are often in charge of our health problems. One can notice that there is almost always a link between studies of obesity and breakfast consumption; these issues seem to come hand in hand. Surely, the link does not exactly mean that the latter causes the former, really. Still, our heart problems often seem to be the result of dietary habits we develop early in life; and usually those habits are not the healthiest. Skipping breakfast is something that frequently sticks with us from an early age (perhaps, our parents had little time or didn’t find it worth the bother to have a good breakfast themselves, or else.) Yet, the study discussed at the beginning of the article makes the causation (breakfast skipping=>atherosclerosis) pretty direct. So, while you may be in doubt about weight loss recommendations based on any of the studies mentioned (or not mentioned here), maybe the Spanish researchers got it right about atherosclerosis. And after all, a good breakfast is always well worth having!